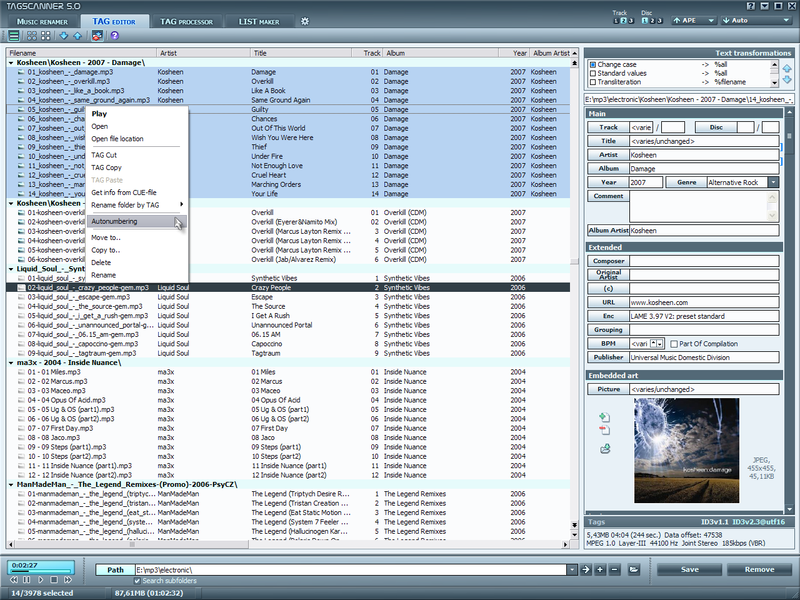 TagScanner is a multifunction program for organizing & managing your music collection. It can edit tags of mostly state-of-the-art audio formats, rename files based on the tag information, generate tag information from filenames, and perform any transformations of the text from tags & filenames. Also you may get album info via online databases like freedb or Amazon. Supports ID3v1, ID3v2, Vorbis comments, APEv2, WindowsMedia & MP4 (iTunes) tags. ...... Powerful TAG editor with batch functions and special features. Playlist maker with ability to export playlists to HTML or Excel. Easy-to-use interface. Built-in player. Qweas is providing links to TagScanner 5.1.611 as a courtesy, and makes no representations regarding TagScanner or any other applications or any information related thereto. Any questions, complaints or claims regarding this application TagScanner 5.1.611 must be directed to the appropriate software vendor. You may click the publisher link of TagScanner on the top of this page to get more details about the vendor.